Capadia Designs: Glitter, glitter, everywhere! 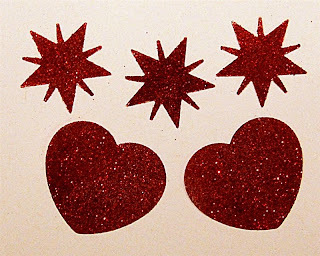 Last week my friend Joy (known as HappyHappyJoyJoy) shared a great idea on her Christmas with the Cricut blog. Joy, Tammy and Melanie have a terrific blog with all sorts of wonderful ideas and projects and lots of giveaways - if you have not seen it here is a LINK - be prepared to spend hours there! 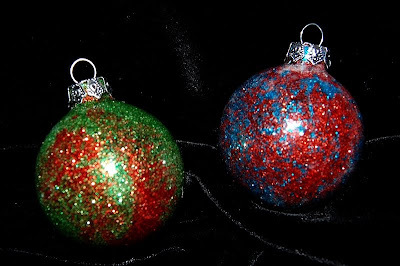 Joy found a fantastic idea for making glitter ornaments and made a video with her daughter. Here is a LINK to the post about the ornaments. Her daughter is so cute and does a great job demonstrating. I couldn't wait to give this a try - I went out and bought the "secret ingredient" the next morning. Believe it or not, you will need a bottle of floor finish to make these. Watch Joy's video for the super simple directions. I want to share some of the experiments I tried and show you the results. I made some ornaments right away and today my neighbor came over for a glitter playdate! We had lots of fun and made a lot of ornaments. If you have a Michael's nearby, the glass ornaments are half price this week. 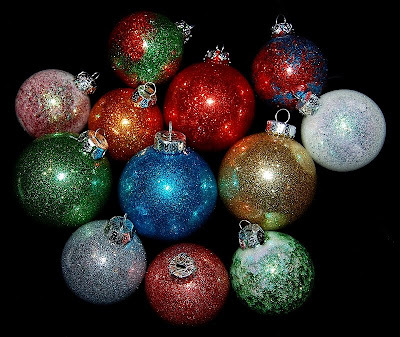 They come in various sizes - the smaller sizes have more ornaments per box. I had some on hand and bought some more (and may even go back to stock up - these are so much fun to do!). 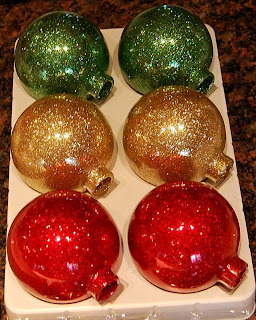 Nancy used traditional red, green and gold for her ornaments. I had done some of these a few days ago and today I tried some other ideas. 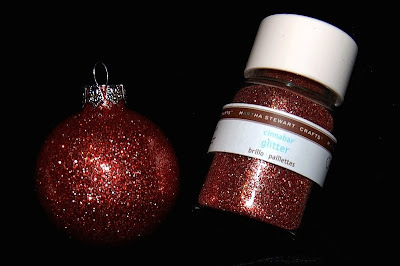 First I tried some coarse glitter - the same glitter I used for the "snow"cards I shared recently (here is a LINK). It does not stick nearly as well as the fine glitter and I ended up with a mess! I dumped out the glitter that wasn't sticking and added a couple of colors of glitter to fill in all the gaps - red and green on one and red and blue on another. The multi-color effect is very pretty but it is difficult to get a nice mixture with smaller areas of color. 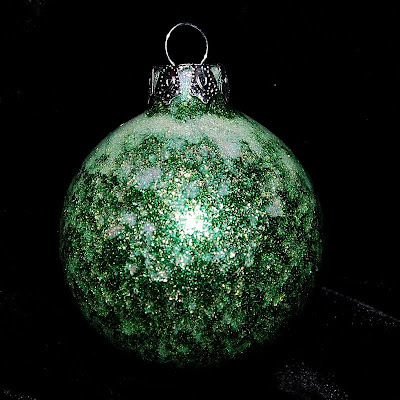 It works best to just add a bit of glitter at a time and to try to send it in several directions as you pour it into the ornaments. Next I tried some fine glitter with a iridescent crystal effect. The lighter color glitter was tricky because the gaps or thin areas are much more noticeable. On the first one (left side) there were so many gaps that I tried adding additional colors again - both red and green. It is hard to get a good photo but the end result was pretty. 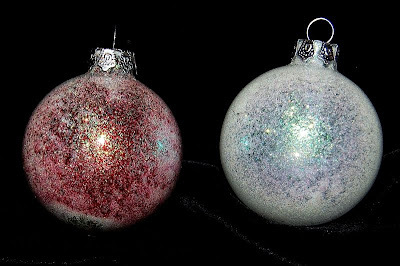 The ornament on the right has only the crystal glitter and there are some thin spots but they are not extreme. Then I got the bright idea to try adding more floor finish to "recoat" the thin areas. I may not have waited long enough for the first layer to dry - or the newly added finish may always dilute the existing layer. At any rate, I poured out the extra floor finish and a lot of the crystal glitter slid out in chunks creating a mottled look. It was thicker at the hole as the glitter drained out. I then added some fine green glitter to fill in all of the gaps. I think this one looks like it has a snow topping. 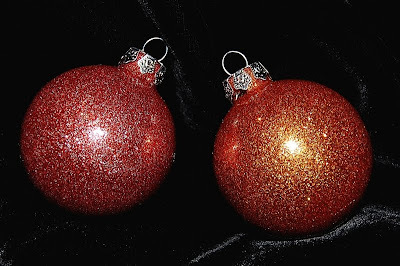 These two ornaments were made using glitter I got on sale last fall after the Halloween items were marked down. 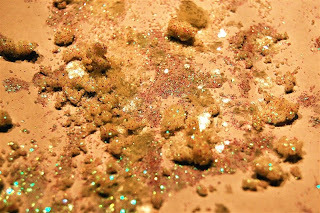 The colors actually work well for Christmas so check to see if there is any "fall" glitter in your local stores. I saw it marked down 90% this year - a great bargain! The first color is "cinnabar" which is actually a sort of mixture of red and silver/gold. It makes me think of candy canes. The second color is "fire opal" which is a coppery orange and will blend nicely with many holiday color schemes. It has a golden look and would look great with a bright chartreuse shade of green. Here are all of the different colors and variations I have tried so far. They are just so pretty even without any ribbons or decorations added to the top of the glass. You can do lots of personalization and these would make great gifts. 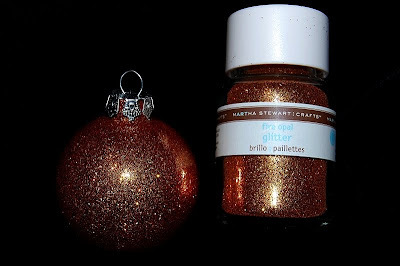 I don't recommend reusing the glitter too many times as you fill each ornament and tap out the excess. The glitter tends to soak up some of the finish and form "globs" (but you might be able to use these in another project). While I was busy with glitter, I decided to try another idea that I had a few days ago. I took a piece of clear packing tape and stretched it across a couple of paper towels, sticky side up. I taped the large piece to the counter on both ends and then dumped a lot of glitter on the tape. I used my fingers to spread it around and to make sure the entire surfaced was covered. Even though the tape is covered in glitter it is still somewhat transparent. 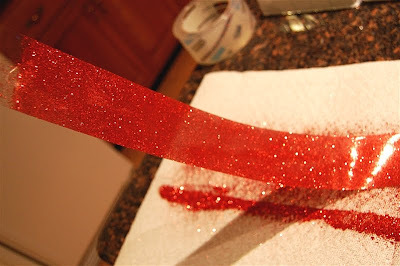 Next time I do this I'll use a large piece of smooth paper - it is difficult to collect the excess glitter from a paper towel. Finally, I stretched the glittered package tape, glitter side up along the counter and taped the ends down with regular tape. Then I carefully placed another strip of packing tape on top of the glittered tape. It is tricky to get the two perfectly aligned - it might be good to do this with a helper. So why did I want to do this? My idea was that I could use the tape to punch out shapes to use for embellishments. I first tried a large simple heart shaped punch - it punched easily so I decided to try a more complicated and delicate design. The stars with the thin rays at the top of this photo also punched easily. I have some more ideas on how to use this glittered tape - I hope to share a few of the projects I have in mind soon. In the meanwhile, I think you would really enjoy making these ornaments. The supplies are not too expensive - the floor finish was about $6 and that bottle will last for many, many ornaments! 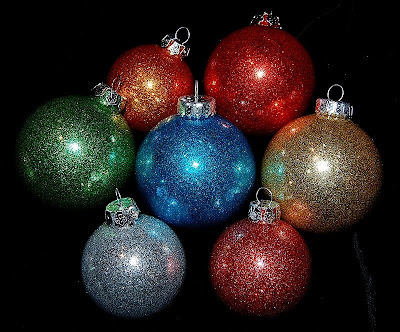 The glitter and plain glass ornaments can probably be found on sale or purchased with a coupon. 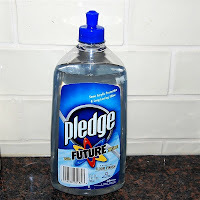 Inexpensive, quick and pretty - a great project! Many thanks to Joy for finding it and sharing the information. Isn't this the cutest!!! I have a few left from last year..so going to give it a try! Yours look gorgeous! I love the projects on this blog, and many of my Christmas cards are from "simple card Mondays." One is with the packing tape behind a card from WW, too cute! Definitely a fun idea for parties. 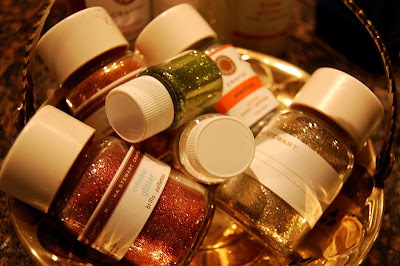 What a collection of glittery fun!! It is so nice that you got to glitter with somebody else together :) Those ornaments look amazing and thanks for sharing all the different trials. Diane more glitter fun off to look for the pledge this morning. I saw another idea yesterday and thought of you it's using lace and glitter and somewhat similar to what you did a few months ago. Lace just reminds me of you. Thank you for so many great and creative ideas! I just love your site and your down home chit chat. You make me feel like we're sitting down having a cup of coffee and having fun. I bought the supplies to make these with my grkids on Sat. Thanks for the info on your experiments. Thank you so much for featuring this! I LOVE all the things you tried! My favorite is the chunky ice blue one! So fun!! I appreciate you and all your posts that are so informative, creative and well written!